In this unapologetic and uncensored autobiography, Andrew Dice Clay, is ready to set the record straight. He was the eighties' answer to Lenny Bruce, with material that stretched the boundaries of decency and good taste to their breaking point and in turn became the most vilified stand-up of all time. From humble beginnings at small-time gigs in Brooklyn, Andrew Dice Clay roared to fame, becoming the only comedian to sell out Madison Square Garden two nights in a row, but his edgy material quickly caught up to him. His billboards were defaced; the premiere of his film The Adventures of Ford Fairlane was cancelled; cast members from Saturday Night Live threatened to walk off when he guest-hosted the program; and he was famously banned for life from MTV. For almost 20 years he stayed out of the spotlight, but Dice would not stay down. Spurred by a role written for him by the creator of Entourage and one of his biggest fans, Dice is now back in the spotlight and selling out theatres and casinos and winning rave reviews from the critics from his co- starring role in Woody Allen's Blue Jasmine. 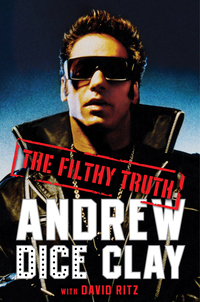 The Filthy Truth is filled with Dice's no-holds-barred humor and blistering commentary as well as plenty of revealing stories, from his early days when the mob wanted to run his career to his friendships with Rodney Dangerfield, Mickey Rourke, and Sylvester Stallone. To advance order the book, you can go to Amazon.